Whenever ,we hear abt sheek kababs,we only think of chicken or mutton.But yes ,we can also prepare using vegetables.these can be prepared ,by frying it or baking .Either way is delicious.Vah chef has again inspired me with this recipe.There are certain strict rules to follow,while preparing these kababs. The first rule is all ingredients ,shud be dry .Moisture is the main enemy to kababs.The second rule ,is chop all the ingredients finely.Bcoz ,if not ur ingredients ,will start separating from the kababs easily while frying.Third rule is ,dont drop it in hot oil,as kababs have holes in the middle,they are quickly cooked.There are chances for blacking out.So when we follow these rules strictly ,we can get a very tasty kababs. * Boil the green plantain and peel the skin and pat it dry. * Grate them and keep it aside. 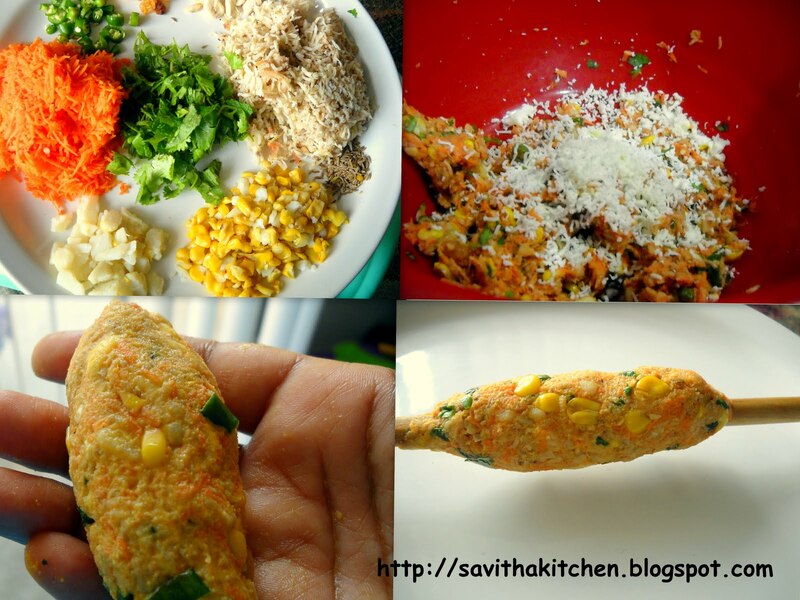 * Grate carrot,potato,cheese,chop green chillies,corn,cashews,cilantro and mint leaves. kababs.We can add any number of veges.But ,it shud be grated finely or chopped well. * Now ,take a mixing bowl and all the veges and dry powders along with cashews , raisins. * Knead ,all the veges for 5 mins ,without adding water. * Now the veges ,wud have blend together as a dough. * Roll it ,into a tube like structure as shown in pic. * Take a spatula or any other round stick,apply oil or water to it. * Pierce in the spatula into the tube like kabab and bind it well.We can also coat it with water slightly to make it stick to the spatula.Now we cud see a hole inside the kabab.This helps it to cook faster. * Now slowly ,remove the spatula and drop it into the medium hot oil.The temperature of the oil shud be medium hot,if not ur kababs wil become black immediately. * Serve it ,after sprinkling chaat masala and squeezing lime juice. We can also bake it in the oven,by placing the kabab with the stick or spatula ,for 10 to 15 mins or untill it becomes golden brown.The degrees can be 400 degrees. We can also skip the addition of corn flour,if the ratio of starchy vegetables like plantain or potato is greater than other vegs.If ur mixture ,is too moist,then we can adjust it with corn flour. 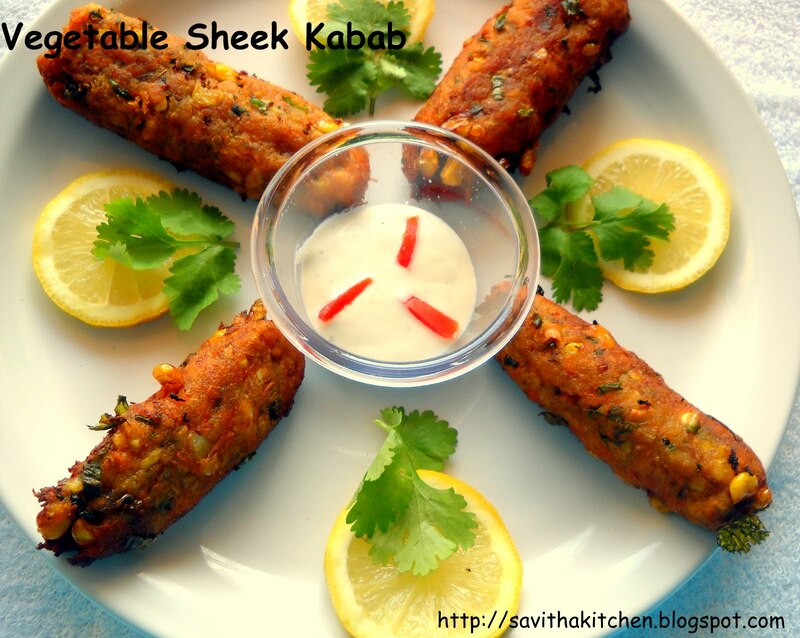 wow this looks good dear...neva tried veggie version of sheekh kebab..bookmarked..will try soon! Wowww i would like to have rite now, soo tempting kebabs..
Mouthwatering and tempting....sure will make it...! bookmarking it....! wow....Savitha..thats amazing ...no words dear,excellent click,very neat presentation,great..
tempting n healthy one...love d excellent clicks..
super cool savitha ! loved ur explanation dear !! Excellent recipe...never thought of using Green plaintain in a kebab...great one.